My previous post was about one photo from the night of 10/11 February 2017 in Rovaniemi. Here are the rest. Bridges are good places for spotlight stuff. You can get pretty much any elevation and have a view from zenith to nadir as shown above. I should have used this nadir-zenith configuration more, its benefits didn't really sink in until late season. 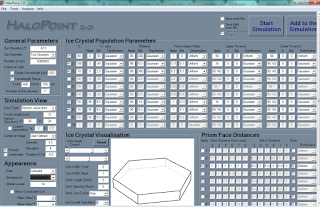 It has a potential to give answers to questions on crystal orientations and shapes that higher up pointing view wouldn't give. "We use fruit, spices, and other unique ingredients in our recipes to complement the flavours of our malt, hops and yeast. The more interesting ingredient, the better." Now here is where I would like to hand it over to you. I know that there are many beer connoisseurs amongst our readers and contributors who really appreciate a fine ale. 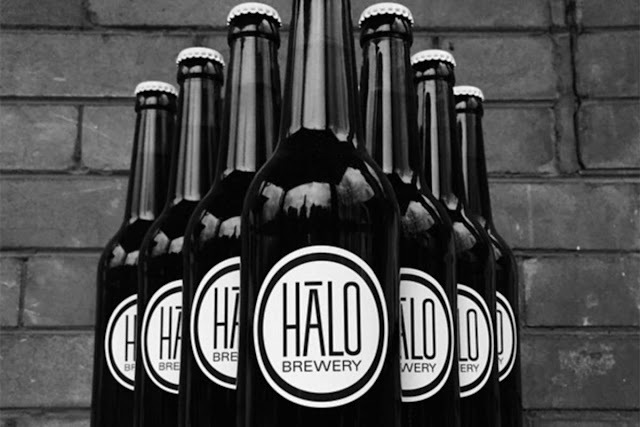 This is a unique opportunity to have a beer named after the subject that is close to our hearts. Perhaps you would like to name it after one of the early pioneers such as Lowitz or Parry, or perhaps you would like to immortalise a particular rare and exotic halo. 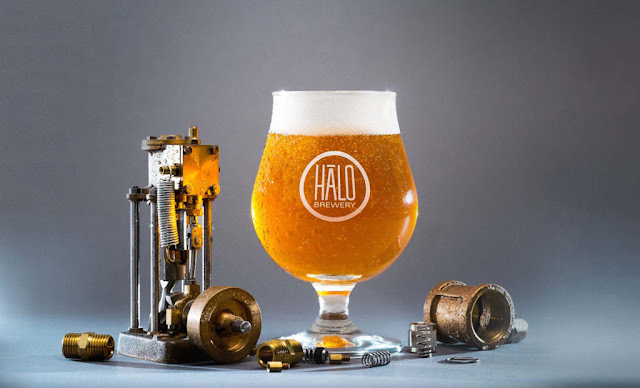 Likewise, maybe you could also suggest a particular style of beer like a Supralateral IPA, a Wegener dubbel, a Tricker trippel a Subsun Sour or a Parhelic Stout. Use your imagination and let's see what we can come up with. Any and all suggestions will be passed on to Callum and Eric for their consideration. I can't promise that they will definitely use any names we suggest but it will be a fun challenge all the same! The Swedish Olaus Magnus’s 16th century Historia de Gentibus Septentrionalibus (History of the Nordic Peoples) has several chapters and woodcuts dedicated to halos. The first part of our series introduced this medieval best-selling work, and concentrated on parhelia and paraselenae as described by Olaus. This time the halos of Book 1, Chapter 14 are to be introduced, which is the very first section of his work where he deals with halo phenomena. We don’t know whether Olaus saw any halos in his life, though in Chapter 17, he notes that there were three suns and moons in the sky at the time of his birth. Besides classical natural historical authorities like Pliny the Elder, his information comes most probably from accounts collected during his journeys, which he later recorded according to his own understanding and imagination. 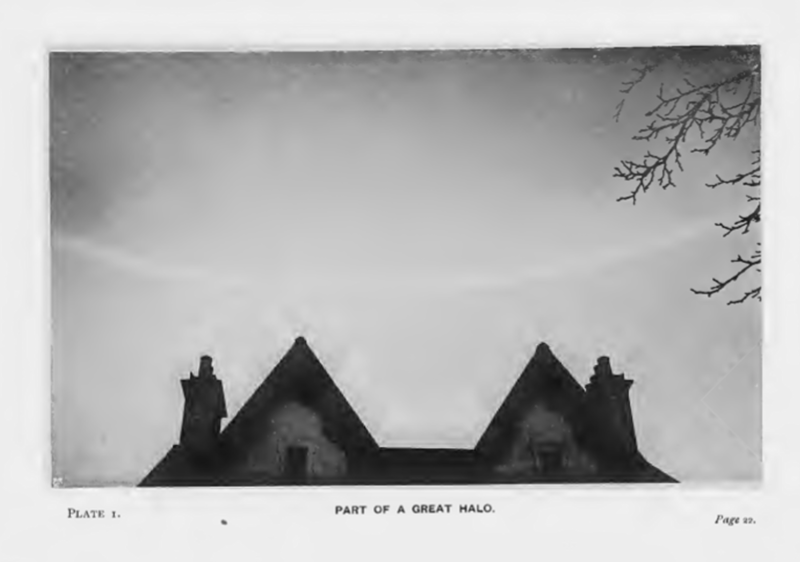 He introduces halos as seasonal phenomena, which are connected to early spring and hardly last longer than two and a half hours. He does not even start the list of halo forms with the most frequent ones: the first halos that he describes are the parhelic circle and three patches on it which could be interpreted as the 120° parhelia and the anthelion. Olaus then continues his presentation with the more frequent forms. The 22° halo, the parhelia and the upper tangent arc are easily recognizable, and so is the circumzenith arc. But what comes afterwards (a blackish rainbow and a dusky but colourful one) is more difficult to interpret. We could deduce from their position in the woodcut that he may be talking about supra- and infralateral arcs, but since the depiction and the description are not obvious and they contradict to what such arcs look like in reality, we should not draw further conclusions from them. Olaus’s description is typical of similar accounts: he presents events which took place over a longer stretch of time, disregarding the changes in halo forms as time passes, what is more, he probably never witnessed such halos in the sky. The woodcut illustrating his chapter might look familiar to people interested in historical displays. It bears resemblance to Vädersolstavlan, an oil-on-panel painting by another Swedish man, Jacob Heinrich Elbfas. The painting is the 17th century copy of the now lost original ordered by the Swedish reformer Olaus Petri, and created by Urban Målare. It shows the halos that appeared over Stockholm on 20 April 1535, 20 years before Olaus Magnus’s book was published. The country at this time was turning to the Lutheran faith, and religious reformation fuelled serious conflicts and controversies between the ruthless reformer king Gustav Vasa, and more moderate Protestants like Olaus Petri. Both parties saw a celestial sign in the appearance of this halo phenomenon, and we can easily deduce that the Catholic Church was also prone to interpreting the halo as a divine premonition. Olaus Magnus himself was the last Catholic archbishop of Uppsala, who had to live in exile for the rest of his life after Sweden had turned to the new religion. Although he does not mention the ominous 1535 Stockholm halo and its contemporary reception, but the striking similarity between the woodcut and Vädersolstavlan might indicate a conscious choice for deciding to start his description of halos in Historia de Gentibus Septentrionalibus with this very emblematic appearance. English translation by Peter Fisher and Humphrey Higgens from: Olaus Magnus, A Description of the Northern Peoples, 1555, Vol. 1. Ed. : Peter Foote, Hakluyt Society, 1996. 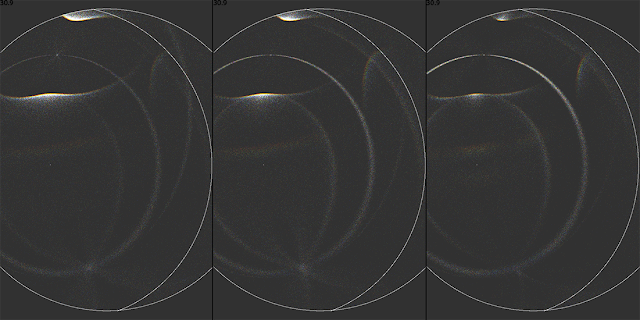 This display shows the very common arcs that according to simulations seem to arise from 3b5 type raypaths in Lowitz oriented crystals (where b signifies basal face). I avoid using any names, first because I am uncomfortable with current nomenclature and second, because the situation with these kind of arcs has become confusing. I am getting to have a feeling that there may be two or even three different halos that look quite similar but have different formation. The match between photo and full simulation on the left is poor. Neither the curvature nor intensity of the simulated 3b5 arcs match with those seen in the photo. The inner arc is curving less steeply in the photo as compared to simulation. And it is most intense near 22° halo while in simulation the arcs barely reach to touch it. I found not possible to make the arcs extend all the way to parhelia in simulation. 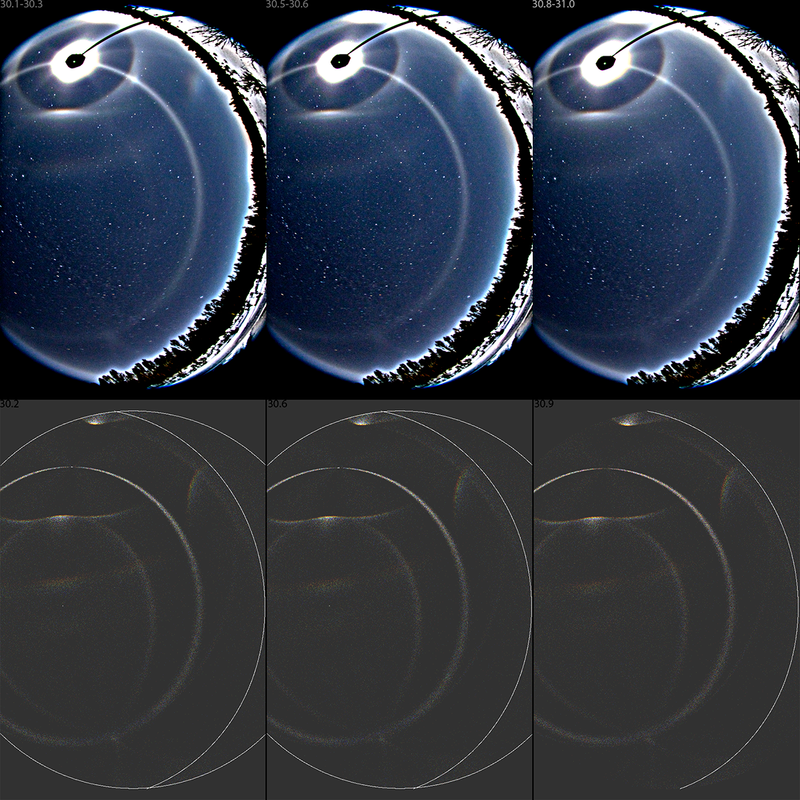 The filtered simulation on the right shows the maximum extent of the arcs. 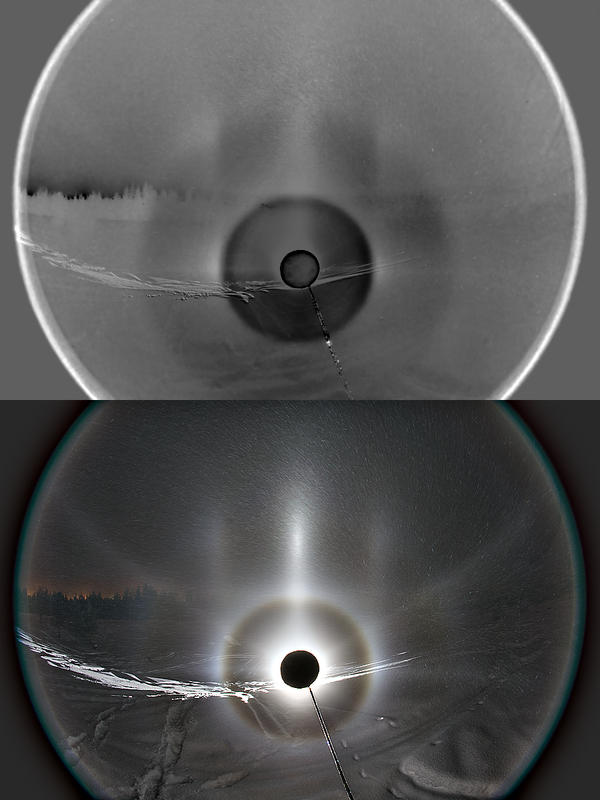 Concerning the shape mismatch, it is also noteworthy that the arcs in the photo are separate from 22° halo while the simulated arcs reach to touch it. 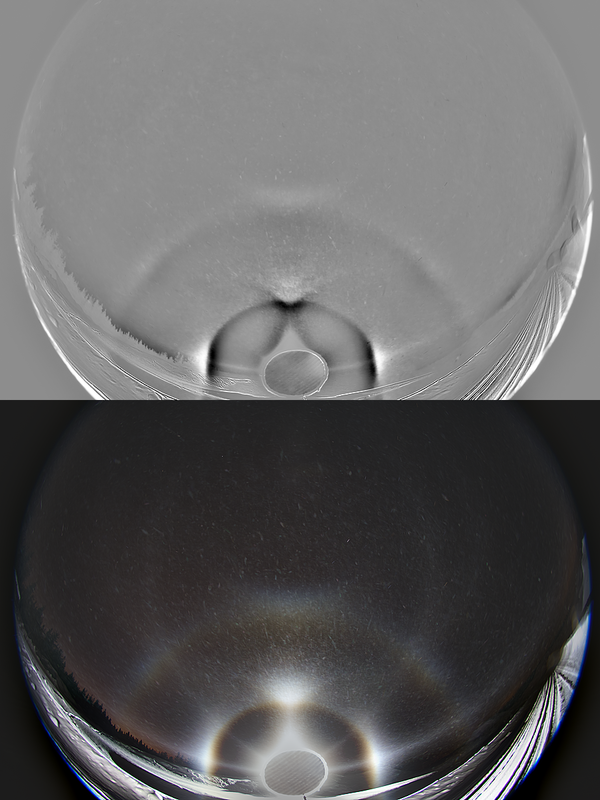 Added to the right side filtered simulation is circular Lowitz arc to see if that together with the 3b5 arcs could explain what is seen in the photo. The shapes don't quite align. It seems to me there are no Lowitz arcs in this display. The simulation light source elevation is -32.3 degrees. 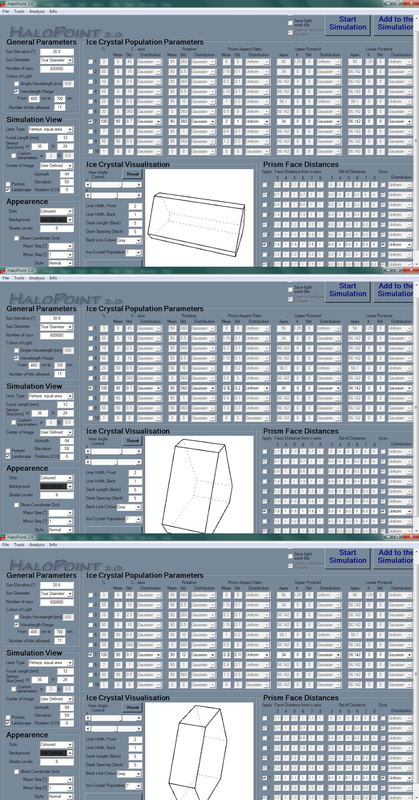 Concerning the crystal parameters, the parameter table below is not the version that was used to make the simulation on the right, I didn't happen to save the last permutation. But it is close enough. There is a plenty of leeway for 3b5 arcs parameters so exact numbers are not important. One other thing worth noting in the photo is the subparhelic circle inside subparhelia. 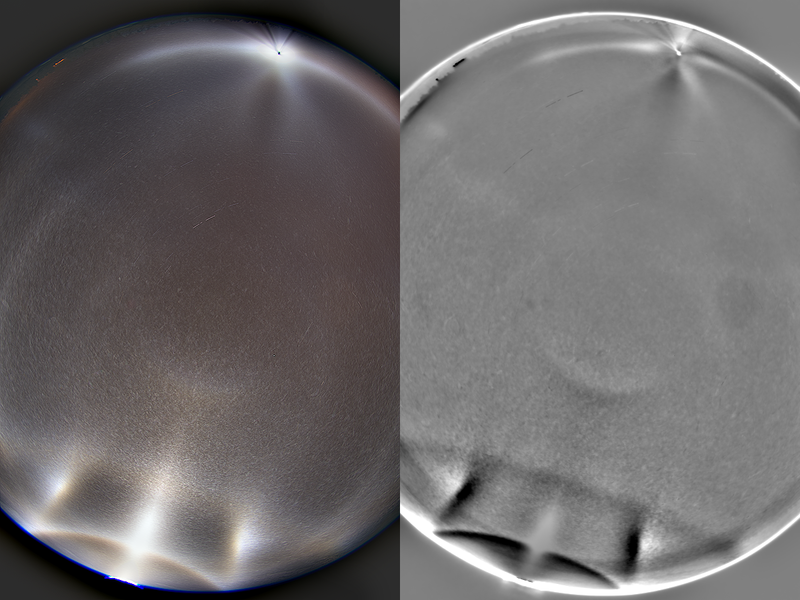 Simulations tell it can be formed by Lowitz oriented crystals as German observers demonstrated recently. Or it can be formed by highly triangular crystals. The effect was visible to the eye and its glitter gave an impression of broadness apparent in the photo. The image is an average of fourteen successive 30s exposures, stacking done with Halostack. The night was 10/11 February. I was a bit late from the show because I was keeping an eye too long at the lowering of the cloud base from my apartment, suddenly realizing when the chimney of the distant power plant disappeared that I have to be going and quick. 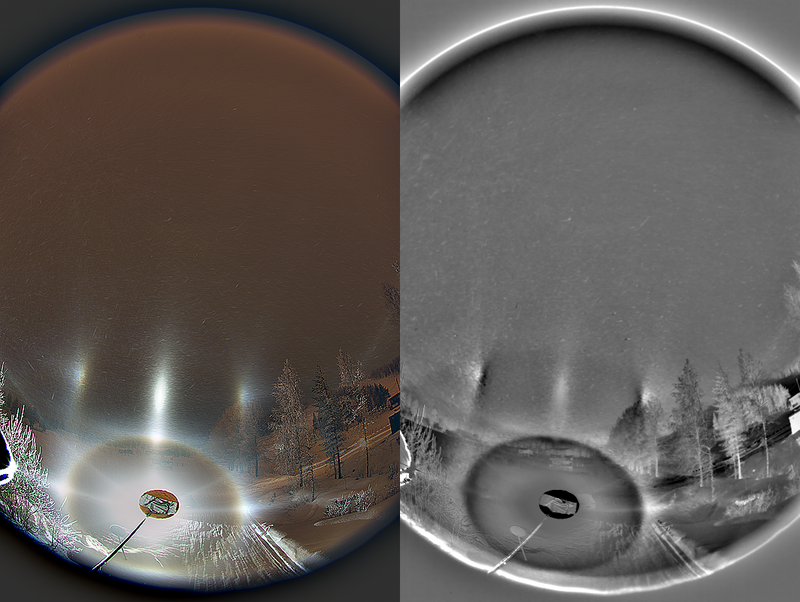 It was full fog when I curved to the scene on the ski slopes side of Ounasvaara and streetlamp parhelia were awesome solid beams. Obviously, my procrastination at the apartment asks for at least 15 minutes of unremitting self-criticism at the next halo meeting. Typically if it is like that when you arrive, then it is already late when you are ready to photograph. Sure enough, by the time I had it all set up, snow flakes were already falling among the diamond dust just as forecasted. But because the fog was still there the diamond dust was able to hold on to it for enough long to me to secure series of photos at several lamp elevations. Of course the rather ample snowfall (which was actually boosted by the diamond dust to even more) greatly reduced contrast, giving a milky background. Considering these far-from-optimal conditions, the display was surprisingly good. Very recently, I also had the great fortune to come across a book, Cloud Studies by Arthur W. Clayden, (John Murray, London, 1905) which includes two photographs of halos. The first shows a 22° halo which exhibits a thickening around the area of the upper tangent arc and a second one which shows a section of the parhelic circle. Considering the book may have been in preparation some time prior to publication, these images might even be slightly older. 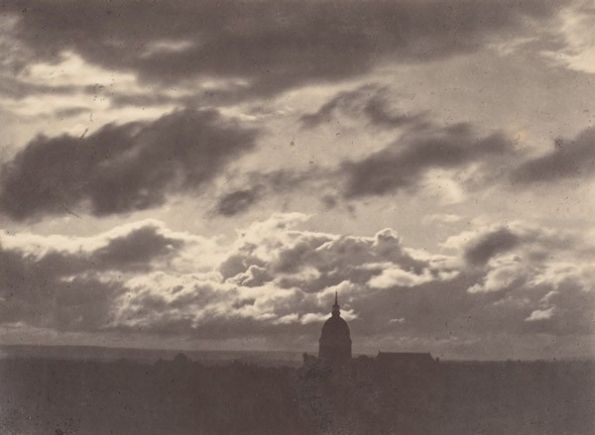 Sky Study, Paris, Charles Marville, 1856-7. © Metropolitan Museum of Art. 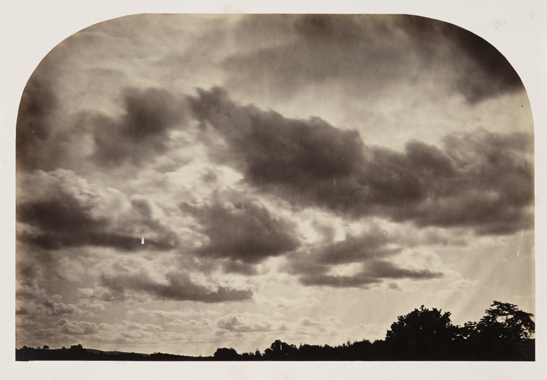 September Clouds, Roger Fenton, 1859. 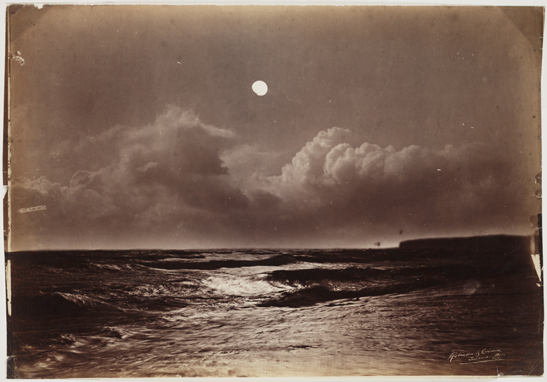 Seascape at Night, Henry Peach Robinson, 1870. So here is where I hand the investigation over to you to play detective. The bar has been temporarily set at 1905, but I am quietly confident that with a little effort we can push the timeline back into the nineteenth century and even further, possibly back towards the 1850's and 1860's. One last sobering thought to bear in mind. 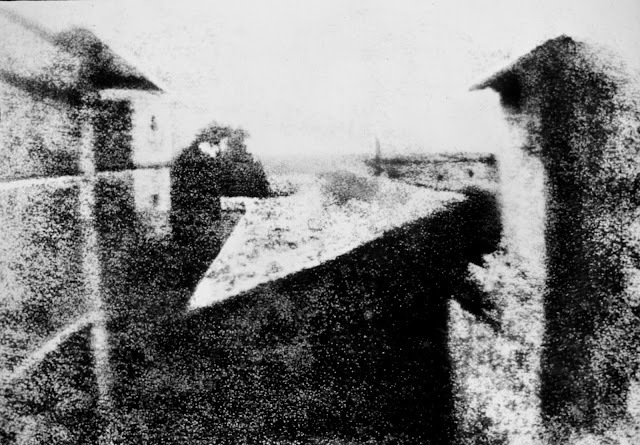 The very first photograph ever to be taken was View from the Window at Le Gras by Joseph Nicéphore Niépce in 1826-7 and was taken from a vantage point looking out on to the open sky which could potentially have contained a halo. View from the Window at Le Gras, Joseph Nicéphore Niépce, 1826-7. On the evening of 9th February I left my apartment to hunt diamond dust halos, but was also supposed make it to Lappland Chamber Orchestra concert. So with the proper clothing for such an high society occasion underneath the overall and several other layers (it was close to -30° C) I half hoped it would be total crap to allow me to slip to the concert to hear live the Shostakovitch chamber symphony op. 110. It indeed was quite crappy, or at least I thought so, and after taking some lunar and spotlight shots I was already driving towards the city - only to turn around and come back to do one last check. That settled it: there was an all sky display developing and DSCH was no more on agenda. Here is highlighted only one set of photos of that display. The three images show an anthelion that moves below the parhelic circle as lunar elevation rises from 30.1 to 30.9 degrees (according to USNO calculator). The images from left to right are stacks of 4, 3 and 4 successive frames with 30s exposures and the values in the upper corner indicate lunar elevation. 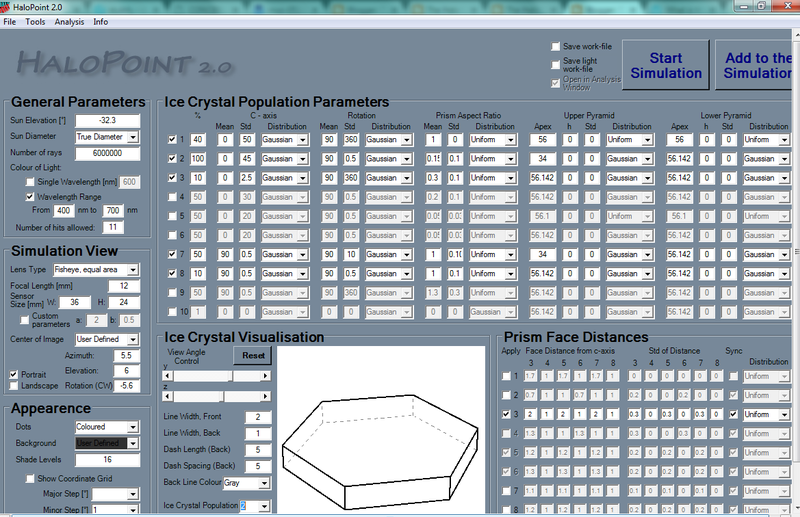 In my attempt to simulate the effect with Halopoint there is only one population of column oriented crystals considered with orientations of the crystals restricted to 12 degrees rotation about the c-axis (parameters are shown at end of this post - the last one of the three tables). This, together with plate shape and slightly triangular habit indeed reproduced something that looks like the pseudo-anthelion in the photos. A look at the raypaths revealed that the effect is an intensified apex of the Tricker arc. 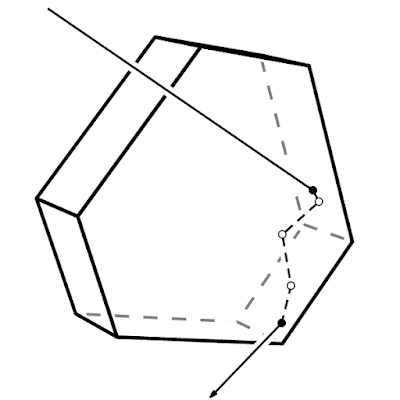 This explains the movement as Tricker separates from parhelic circle at light source elevations higher than 30 degrees. To show it in its true form, below left is a filtered simulation that has only the Tricker rays responsible for the effect and for comparison next to it a full simulation with all rays. Further below is depicted the beautiful raypath. This type of variation of Tricker arc raypath which enters and exists through basal face is also drawn in Robert Greenler's "Rainbows, Halos and Glories" on page 85 and Tape's "Atmospheric Halos" on page 26. The set of simulations below compares two scenarios of traditional diffuse arc anthelion with the Tricker arc pseudo-anthelion. Actually, in the middle simulation both effects seem to be present. Parameters for these simulations are given further below. 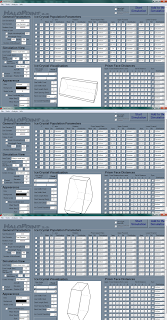 Left to right order for simulations corresponds to top-bottom order for parameters. So accepting that this pseudo-anthelion is an anomalously brightened Tricker arc top, I am however less certain about the correctness of the suggested mechanism behind. The simulation does not come out that convincing when you look at the other parts of the display. It seems to me there is going on something that I have no idea of (or then I just didn't simulate enough, like has happened in the past). One curious thing is the lack of subhelic arc in the display. Only if I used plates that were h/d 0.2 or thinner could I get rid of the subhelic arc. But that made the simulation in other respects even further from the reality. Such h/d values were also too small for the pseudo-anthelion which seemed to thrive in quite delicate balance around 0.3 value. For reference, see an earlier case where simulation with thin plates in restricted column orientation (or poor Parry orientation) produced a good overall match with spotlight display. I guess next winter I must shape up on crystal sampling to see if displays like this really don't have columns in the dish. The display itself was rather faint. No hope of seeing, for example, that pseudo-anthelion even though I saw from the camera display that it was there (and thinking it is just a normal anthelion). I'll be posting on some later occasion more photos from this night, including spotlight stuff. This photo by Hungarian photographer André Kertész taken exactly 100 years ago. 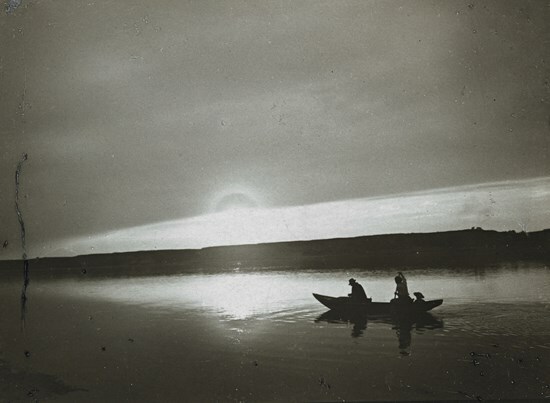 Kertész became world-famous for his innovative and ground-breaking photographic techniques and the new perspectives he used in photo-journalism. The image above has created much discussion recently in the Hungarian halo-observers' forum, and generated some international correspondence. What can we actually see in this photograph? At the very first superficial glance this is like a solar halo with its reflection in the river. 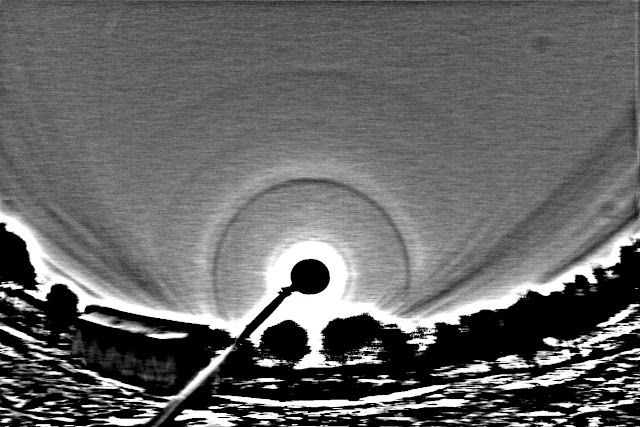 The light also becomes diffuse around it, so had the photo been modified, this would really be a masterpiece of manipulation from 1917. 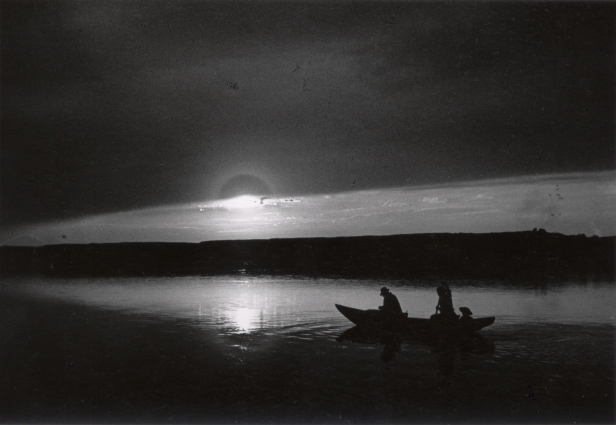 But Kertész was known for his documentary style not for remaking his photos. However, if it was a halo, the image must have been taken by a lens with ultra wide focal length, which would not be commensurate with the boat in the foreground. The size of the feature could indicate a corona, but would a corona appear like this in a photograph made with a gelatin silver photographic process and the camera Kertész was using at this time: a Voigtländer Alpin 9×12 cm with a 6.3 lens? Nicolas Lefaudeux has given an explanation for the riddle in the comments section. The image (see below) he found of the same Kertész photo with but a different development confirms his point. The photo appeared in maimanohaz.blog.hu in 2015. This display occurred on 22th February 2017 in Izborsk (Pskov region, Russia). In the morning it was sunny and the first cirrus started to arrive around 13-00. In that moment, I saw a faint 22° halo, but it was visible because the cloud layer was smooth. Also it seemed to me that I saw a 9° halo through the viewfinder of my camera. 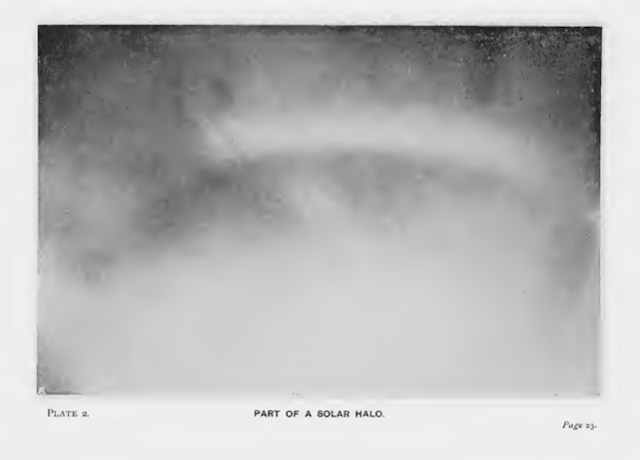 The stacks showed pyramidal halos such as 9°, 24° and 35° halo. The 24° halo looks pretty curious, because B-R processing shows the pause in 24° ring in area of upper tangent arc. It reminds me of 24° column arcs from crystals with big tilts. 9° halo also looks curious, brighter on the sides than on the top, what looks like 9° column arcs. 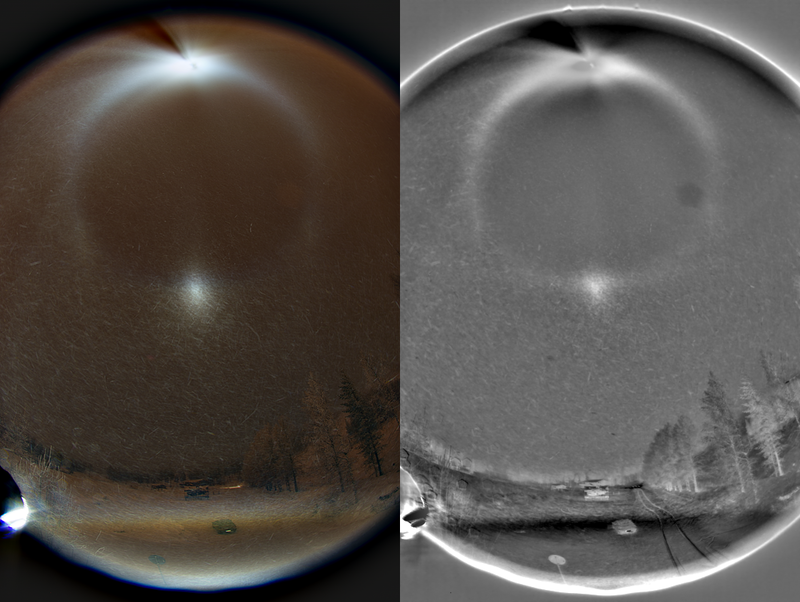 This was seen on 24 January 2017 in Rovaniemi. The image above is a total of 24 minutes exposure (48 frames). It shows all four kaleidoscopic arcs, which is not really that uncommon combo in the beam reality. Just before the diamond dust disappeared I took also a rare positive elevation lamp shot as shown below left. It's got 5 minutes total exposure. Below right is one of the first sets of the evening with 3 minutes exposure. The br reveals the insides of 46° and 22° halos are somewhat reddish. It was quite cold, I think temperature was somewhere around -28° C towards the end of hunt. Unfortunately my halo hunt diary is no more because the folder called "halo" recently disappeared from the computer desktop without leaving a trace. It seems the universe don't want those notes to exist. Already earlier this season it got corrupted, all letters turned into #s. But I have a safety copy which has last winter's notes. At least for the time being. 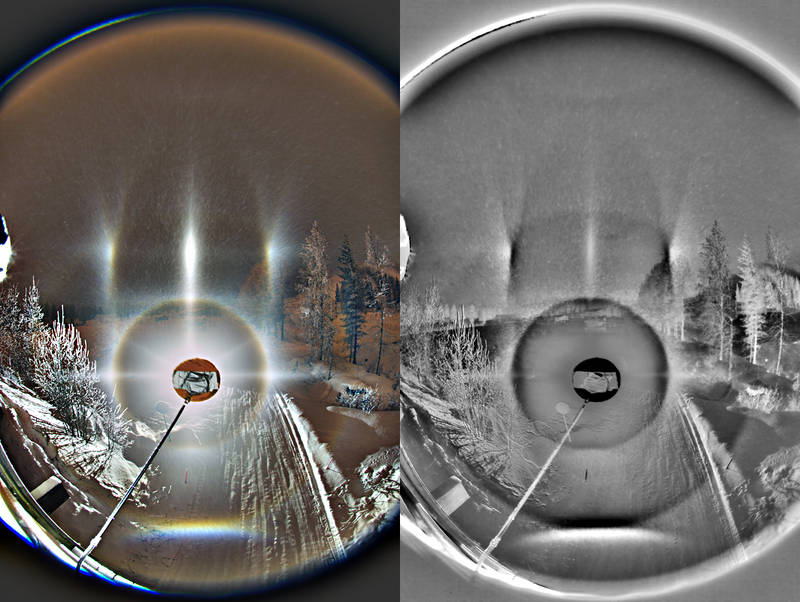 Thanks to Panu Lahtinen, who stacked the image above when my Halostack had some mysterious glitch.